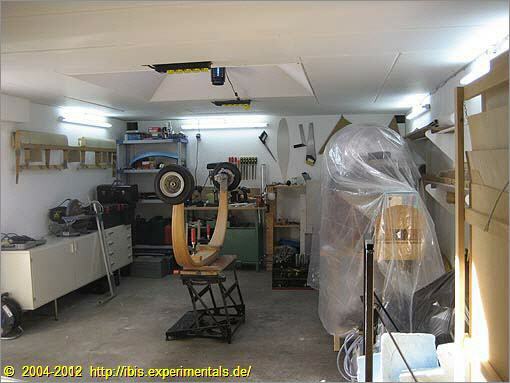 The workshop that houses my experimental aircraft project initially was a far cry from anything you'd call a workshop. been decommisioned long ago. It was too rusty to bring back to life.<br>Needless to say, that I had to invest a lot of time and money to put things right. The paragraphs below detail some aspects of this effort. Two individually switchable circuits with fluorescent lighting keeps the workshop brightly lit. As an extra, I mounted three power cord extension blocks in the ceiling panels. To better understand what I am writing about, the workshop floorplan is shown by the adjacent illustration. Please click on it if you want to see a larger version. The former double garage (10m deep) was divided onto a workshop and storage space by inserting a new wall. This new wall contains a removable panel that is wide enough to roll out the IBIS fuselage on its own gear. Our double garage wasn't suitable for any aircraft homebuilding project, except perhaps for a rivetted aluminium job - if you like to work in a cold and dark workshop. Heating was called for, but installing just a heater would have heated the neighborhood, less so my workshop. 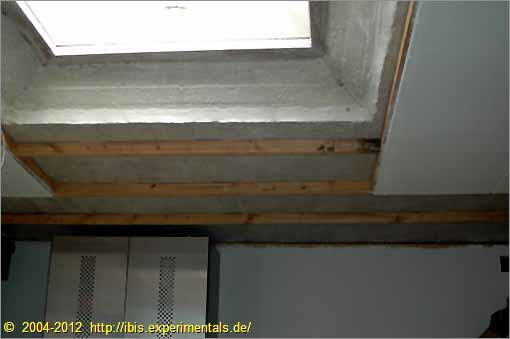 I mounted 6 cm (almost 2.5") wooden girders to the wall and put 6 cm insulation material in between them. That green stuff you see on the left side of the picture is the insulation material. This setup is covered with 12 mm (appr. 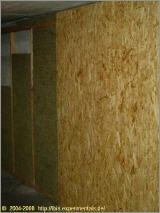 0.5") particle board. 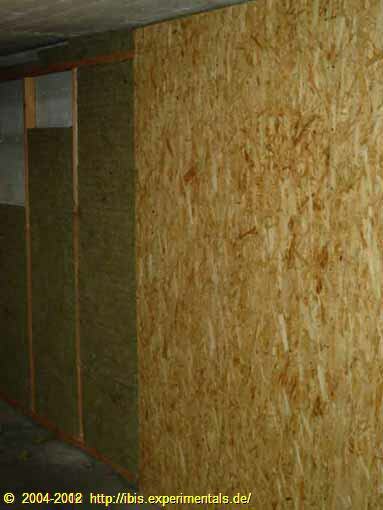 So, all in all, the walls got covered with 7.5cm (3") worth of material for thermal isolation and sound proofing. The ceiling was treated similarly, except for the covering. Here I substituted the particle board for a more cost effective alternative. The next thing I did was to paint everything white, to get the most from those photons that the (at this stage yet to be installed) lighting is going to shed. Ceiling insulation almost done when this picture was taken. Tell friends about this website!